I’ve been blessed with the opportunity to travel to more than 40 countries — five continents down, two to go. As a communicator, one of the ways that I enjoy telling my story is through film. Here are a few films that I’ve shot and edited from recent travels. I travel often, but haven’t traveled with my family since 2005. This video, all shot on an iPhone X, was filmed this January in Spain, Portugal, and France. Nine friends from the U.S. traveled to Santorini, Athens and Amsterdam during the 2017 Thanksgiving holiday. This is the recap video with shots from a DJI Mavic Pro, DJI Osmo, iPhone X and a GoPro HERO 5. I traveled to Japan and Singapore in March of 2017. This is the recap video featuring shots from Tokyo, Kyoto, Ishigaki and Singapore. October 2016: Paris, Nice, Monaco. In the end it’s not the years in your life that count — it’s the life in your years. Austria, Israel and Germany: Thanks for the memories! Three continents, seven airports and 16,581 miles later, thanks for the memories. All footage filmed on a DJI Osmo. Thomas Manning is (officially) getting married. Here’s the story of his bachelor party. In 12 years of baseball camp, today was perhaps the most memorable day that I can recall. Simply put, Thursday was rough on our team and I was a bit concerned how they would bounce back today as the camp had a slate of six games. After dropping their first game, they managed to string together five-straight wins while gaining plenty of confidence, supporting their teammates and overcoming adversity. We lost two of our campers due to injury today and the team came together and found a way to win. The coolest part was that I was able to play defense with them – granted it was right field and I had to dial it back. It was a great experience to be able to share my passion for the game of baseball with the campers by playing alongside them. However, the most important moment today came during our team time session where I was able to share my testimony which focuses on my Dad’s stroke. If you haven’t heard the story, let me know and I’ll gladly share it with you. Long story short – I told the campers that if my Dad had not suffered a stroke in 2003, I likely wouldn’t have been speaking with them in Germany and I likely would have never met them. His stoke changed his life, my life, my mom’s life, my sister’s life and the lives of our friends and family. God has a plan for all of our lives and we have to trust in him through faith. Using the story of my Dad, the campers were very attentive and even asked several follow-up questions about God. One of my favorite memories growing up was playing catch with my Dad in our front lawn. To share his story at baseball camp while explaining God’s Grace, that was a tremendous feeling and I hope that a foundation was planted for my team so that they may ask more questions – not just about my Dad – but of God’s love for us. Tonight during our evening service we celebrated the 12-year partnership between FBCTW and the church in Lübbecke. The relationships that we have developed during the last dozen years have created what we have coined a baseball family that is focused on God. While The Woodlands and Lübbecke have enjoyed a rich relationship throughout the years, we partnered with a church based in Kyle, Texas, during camp this week. Jonathan Leftwich is the senior pastor at Fellowship Church at Plum Creek and I sat down with him this evening to discuss his impressions of baseball camp and what his takeaways will be as Plum Creek begins to evaluate a prospective partnership with a Germany church. Click the SoundCloud link below to listen. As it turns out, the Big Red Machine can be stopped – temporarily. After beginning the camp with a perfect 4-0 record, our team dropped their two games today, but I think it was for the best. Although we stumbled, we were able to see some things that we could improve upon and I feel that the team became more open and supportive of one another – and more receptive during team time sessions. My campers wanted to see me take a few swings in the batting cage this afternoon — it felt great. When it comes to the team stumbling, the first thing I was reminded of was the DC Talk song “What if I stumble,” which you can listen to here. To me, that song has a direct connection with our team time discussion today that focused on Romans 5:8-9. The song centers upon Christians and their constant struggle with missing the mark and falling short in life. Romans tells us that Christ died for the ungodly – which is all of us. It’s not based on how loveable we are, but God’s supreme love for us. Essentially, Christ paid our debt and reconciled our sin because God has unconditional love for us. As mentioned earlier this week, baseball camp is more than just winning and losing – and I hope that our team was able to see that today through our games as well as team time and our discussions. Continuing with our interview series today, I spoke with Thomas Albrecht who plays an instrumental role in organizing the annual camp in Germany. 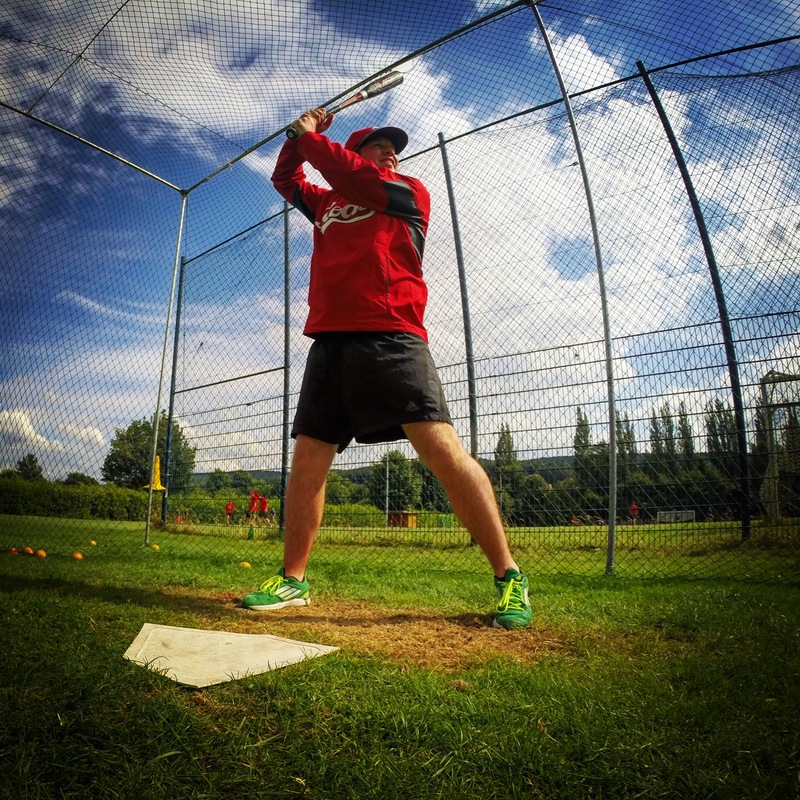 Find out what he has to say about Baseball Camp in Lübbecke. First off, thanks to everyone for reading these posts and sending me emails or texts – it means a lot and is quite encouraging. With rain in the forecast this morning, we dodged a bit of a bullet and had sunshine all day with temperatures in the mid-80s – perfect baseball weather! For those of you keeping track, the Reds moved to a perfect 4-0 on the season and outscored their opponents 13-3 with all three proving to be unearned. The kids are having a great time and are quite responsive to our discussions both on and off of the field. Tonight we’ll meet up at the church for an evening service with great music and games. Here’s a quick video from the afternoon of the team running out to their positions. 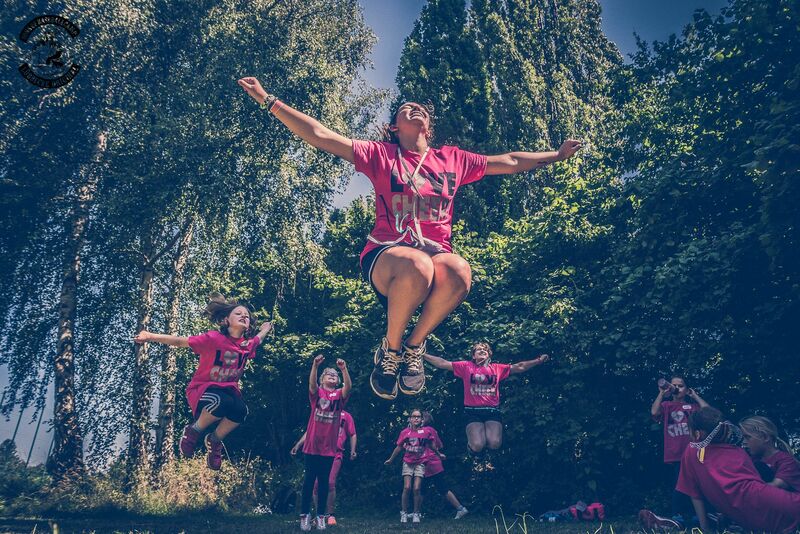 As mentioned yesterday, Cheer Camp has become quite popular here in Lübbecke and has been the highlight of the week for many of our campers. I had the chance to speak with our cheer coordinator, Tammy Washburn, following today’s camp. Take a listen as she discusses some of the highlights of the week and how the camp has grown here in Germany. That’s all for now! As they say in Germany, tschüss! Today marked the first official day of baseball camp in Lübbecke and it was quite the success. With nearly perfect temperatures in the mid-70s, more than 200 campers showed up this morning – about 120 for baseball and 80 for our cheer camp. We opened this morning with a meeting between the coaches, translators and volunteers and I was tasked with leading our devotional of the day which covered Ephesians 2:8-10 – Grace through Faith. I stressed that baseball camp is more than a game and that this week is not about winning or losing. Rather, our primary focus here is to use baseball as the tool to glorify God by making disciples who transform the world. 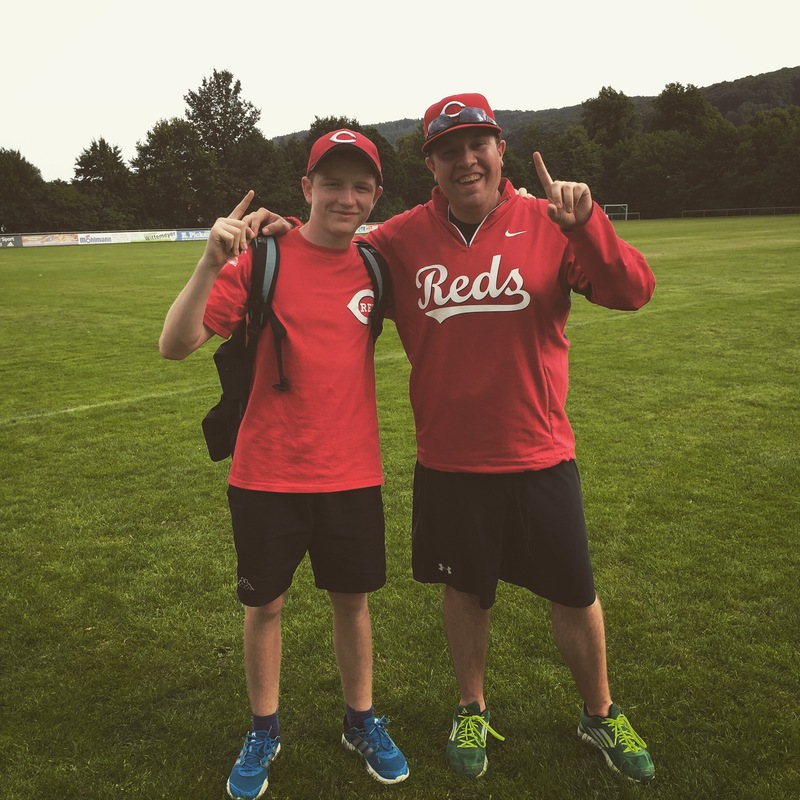 My team, the Reds, is comprised of campers ranging between 15 and 18 and you can meet them by watching the below video. At work, one of our core values is One Team and the Reds are the perfect example of what that means. The entire group is highly supportive and many are camp four-year camp veterans. Transitioning from a station leader to a coach has been a great experience and allows us to develop one-on-one relationships with our core group of campers while being intentional about discipleship. I’m really looking forward to seeing what the rest of the week has in store. While trying to upload a video interview yesterday, I realized that it would be a difficult task with a spotty internet connection. With that being said, I really liked the Q&A format that we had and wanted to continue that as the week moved along. However, today our audio is actually audible. Please listen below as I spoke with Darryl Egley about his experience at the baseball camp and what his outlook is for the remainder of the week. As always, please leave comments and/or feedback below. UPDATE: While waiting for the video to load to YouTube, you can listen to the audio on SoundCloud or you can listen to it below! Hey, everyone. Thanks for following along as I post updates from baseball camp. I wanted to let you all know that I recorded a video interview with Krischaan Albrecht on my GoPro this evening. The audio is a bit faint but it’s a good outlook on what the camp has meant for the community her in Lübbecke. With that being said — hold tight. The video is taking quiet a while to upload. I’m hoping to have a compressed file loaded shortly. Stay tuned. Prior to beginning baseball camp in Germany, I spent 1.5 days in Belgium touring both Brussels and Brügge. While both cities were unique in their own right, it was fascinating to explore these two towns on foot with hardly any pregame plan or direction. Equipped with my iPhone and GoPro, I walked about 20 miles over the course of my stay and frequented Belgian pubs for a few staples – Belgian beer, waffles and chocolate. Perhaps the coolest place I stumbled upon was Cafe Vlissinghe, located just a few hundred meters from the canals in Brügge. What made this place special was the history – the pub is celebrating its 500th anniversary this year and proved to be the perfect environment to enjoy a beer while sitting on the outdoor patio while listening to about a half dozen languages being spoken. 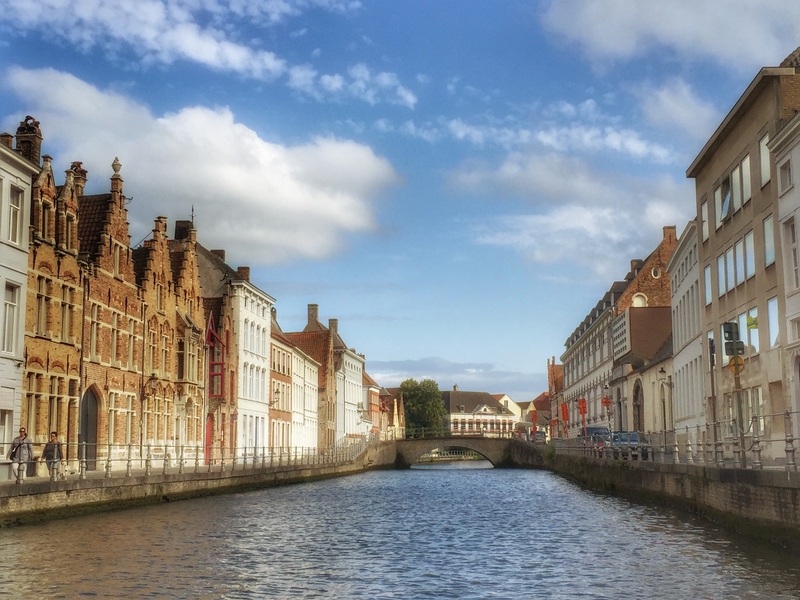 My brief stop in Belgium was also another first for me – it was the first time that I have traveled solo in Europe and it happens to fall alongside my 12th or 13th trip to the continent. It’s a completely different animal to travel alone – more on that later. Anyways, I arrived in Lübbecke earlier this afternoon and we’re having a Bavaria night this evening with members from the local church – this should be fun. Absolutely awful to see this beautiful building on fire today. I captured this photo on an overcast day in January 2018 as flood waters were rising along the banks of the Seine River. I had the chance to sit down in a small group setting this afternoon with former Starbucks Chairman and CEO @howard.schultz. We had a great conversation on the future of this country, what is or isn’t working for Americans, and what we can do to fix it. I’m certainly interested to see if he throws his name in the ring ahead of 2020. It’s officially midnight in Oman which means it’s Dec. 12 and this one’s 30th birthday! I wish I could be there to celebrate with you — have a wonderful time in Aberdeen on your big day!